Dazzle the whole family by discovering any of Québec’s many tourist attractions featuring various aerial, terrestrial and marine wildlife from the province and abroad! Québec’s zoos and wildlife parks feature local and exotic species that will amaze visitors of all ages, who will also get to learn about their characteristics and lifestyles. Some locations also showcase wildlife living in semi-captivity in natural habitats that visitors traverse by car (Parc Safari, Parc Omega) or tourist trolley (Zoo sauvage de Saint-Félicien). Some zoos also feature entertainment areas with rides and shows. Moreover, families can take a dip in the water parks at Parc Safari and Granby zoo. Guaranteed fun! 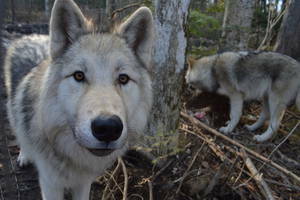 Some humanitarian facilities, such as Refuge Pageau, also nurse wounded animals back to health and prepare them to reintegrate their natural habitat. Are you an early riser? That’s great, because you’ll get to see animals enjoy their breakfast. Moreover, since temperatures are cooler in the morning, they are more likely to be out and about during that time. Come witness their morning rituals. Like us, they like to wet their whistle after waking up! Animals don’t like noise. In fact, it scares them! While being silent is no easy task when travelling with the entire family, you can try and be as quiet as you can to enjoy their presence and observe them in their natural habitats. Our animal friends love to play hide-and-seek. However, as long as you’re patient, they eventually will get over their shyness and come out! Several zoos also feature seasonal events. Dive into the mysterious world or aquatic wildlife in any of Québec’s specialized marine centres and discover new species. The Aquarium du Québec features over 10,000 species of fish, reptiles, invertebrates and marine animals, including polar bears, walruses and seals. Visitors will also have an opportunity to observe jellyfish and seahorses. Looking to know more about the St. Lawrence River’s sea life? Head to the Montréal Biôdome’s Space for Life or Exploramer - Discovering the Sea in the Gaspésie. 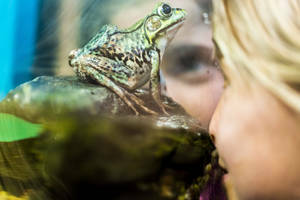 Amphibian and reptile fans will love the Reptilium at Parc Safari, the Bioparc de la Gaspésie and the Aquarium du Québec. Come discover caimans, chameleons, iguanas, snakes and many other species!